Happy Memorial Day to my fellow Americans! I am spending the day at Six Flags with my family but didn’t want to miss out on posting an MMGM. Today’s review is on a title that kept jumping out at me, much as words do in the story itself :). So many people were recommending A SNICKER OF MAGIC by Natalie Lloyd, I had to read it, and I’m so glad I did. 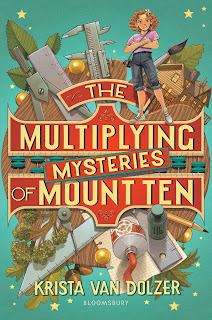 Felicity wants to stay in Midnight Gulch more than anything, but first, she’ll need to figure out how to bring back the magic, breaking the spell that’s been cast over the town. . . and her mother’s broken heart. “The word slithered across the cafeteria table, which didn’t surprise me at all. Lonely had followed me around for as long as I could remember. I never caught that stupid word in my blue book, but it kept showing up anyway. I knew it didn’t make much sense to see lonely in a place like the Stoneberry cafeteria, because there was a constant clatter of noise: forks and spoons clanging, lunch trays smacking down against the tables, and people yelling things at each other like ‘Save me a seat.’ There were hundreds of people in there, or at least fifty, so I shouldn’t have been lonely. 3. Felicity’s journey – Felicity is dealing with multiple insecurities at the beginning of the story. First, her family moves so much she has a hard time making friends. And second, she doesn’t know how to share her words. She learns how to deal with both of those insecurities during the course of the book, and I really enjoyed watching her grow. 4. The friendship – This friendship is so perfectly middle grade because of Felicity’s insecurities, plus the added hint of a first crush. I love the way she reacts when she first meets Jonah. The way their relationship grows over the story is incredibly sweet. 5. The ending –I don’t want to give anything away, so I’ll just say I appreciated how true to life the ending was. I am so holding in other comments that would be spoilery :). So, this book definitely lives up to the hype. Go read it! It might be a couple of weeks before I have another MMGM as I have a backlog of YA and adult books on my TBR list, but when I do, it will probably be another giveaway :). So glad you liked this. Me too. And I so agree with your review, especially about Felicity’s voice. Have a great day! I will read it soon as this one has been on my list of must reads for some time. It has a very lyrical tone with the examples you provided. Thanks for more insights on this book everyone seems to love. This is another one that’s on my list! It sounds wonderful! I adored this book. And yes, the voice has flavors of Three Times Lucky.